Yesterday I posted about how I will cook one huge meal, and then use the leftovers for two additional meals, but slightly modified so that they are entirely new meals. I shared how I do this with chili, and now I’m going to show you how I do it with BBQ chicken! This is really such a simple concept, but it is so helpful for a busy, stressed Mom, and really doesn’t require significant additional time, unlike making freezer meals (which is also another great way to make mealtimes less stressful, but for me, I have to have a block of time to set aside to actually do it!). Day One: You are going to need to figure out exactly how much chicken to prepare for three days worth of meals. Take your normal amount, and multiply it by three. I generally just use boneless skinless chicken breasts, or bone-in chicken breasts, and pull the meat off the bone. If you are really strapped for time, you could pick up three rotisserie chickens at Costco, pull the meat off and call it a day. Costco has the best price and the biggest birds, so get them there! I generally just prepare my chicken in the crockpot, now that I have an Instant Pot, I could do it there too. Preparation is super simple, though. Throw the chicken in, season it with salt and pepper, and any other seasonings that you might like with BBQ, and let it cook until the meat is easily shredded with two forks. You are going to want to start this before lunchtime because remember, your crockpot is going to be packed to the gills with three times more meat than you normally cook. After the meat has cooked, shred it up with two forks and either put it back in the empty crock (toss or save the broth for later). You are now going to douse it liberally with your favorite BBQ sauce. We use Sweet Baby Ray’s, but the brand isn’t important. You could even make your own if you have a recipe you like and have time. Make sure that your chicken is good and saucy though, you don’t want it to be dry. You are going to serve meal one with buns or rolls (homemade or store bought), a salad, and some fruit if you have it. If your children are hearty eaters, you may want to serve an additional starch, so that they don’t eat too much of the chicken. (Another way to avoid the children eating too much of the meat is to only put out one-third of the total chicken. Cover and put the rest out of site). 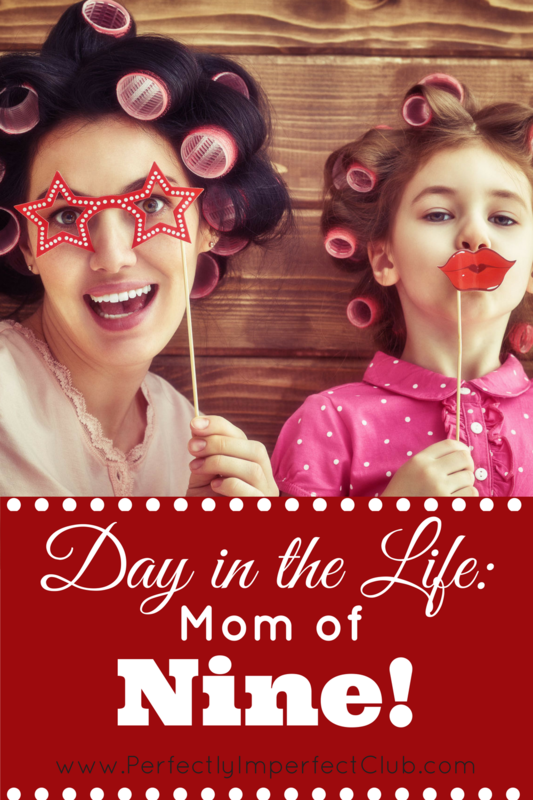 We love potato skins in my family, and they are a really cheap way to stretch a meal! Bake your potatoes: for younger children, I bake one per child (remember the middle will be scooped out) and for older children, 8 and up, I will bake two). If you have a lot of extra potatoes, feel free to bake up more, this is so easy to stretch by just putting less meat on each potato. After your potatoes have baked, you will need to let them cook enough to handle. Cut them in half lengthwise, then scoop out the middle. I try to leave about 1/4 inch of potato still in the skin, but reserve the rest for fried potatoes at a later time (with breakfast or lunch) 1/4 inch seems to be just the right amount. Season your scooped out skins with salt and pepper, I also use some garlic and onion powder. After seasoning, add your bbq chicken to each skin. and spread it out. Depending on the size of your potatoes, I will add one to two tablespoons of meat to each half. Once the meat is evenly distributed, sprinkle with some shredded cheddar cheese, and put them in the oven. I usually leave them in a 350-degree oven for about twenty minutes, but they just need to be hot. This is a really simple meal. You can use your favorite pizza crust for this recipe, you can buy the Pillsbury pre-made pizza dough (the one in a can), or you could even buy a pre-baked crust. Get your dough shaped into a pizza shape, either round, or pressed into a rectangular jelly roll pan. Spread the dough with bbq sauce, the same way you would spread out your pizza sauce, and in the same quantity. Spread the last of your BBQ chicken over the pizzas, and then top with red onions (if your family likes them, you can use raw red onion, or sauté them first), and I like to use a mix of cheddar and mozzarella cheese to finish it off. Bake in a 450-degree over for 10-15 minutes, until the crust is gold and the toppings are hot and bubbly. If you are using a pre-baked crust, follow the package directions. Serve with a salad and fruit if you have it. These three-day menus are such lifesavers for me, and they do a fantastic job of keeping the family from getting bored. Each meal is so different from the last that nobody notices or cares that the food is partial left-overs. If you have been thinking about teaching manners to your children, then you have probably already noticed that there is a world of difference between a polite, well-mannered child and a child who hasn’t been taught basic courtesy. Well-mannered children are not just born, and manners are not an inherited trait. A mannerly child, or adult for that matter, has been taught, and corrected, and corrected again. Manners go against human nature. They are about preferring others before yourself. Manners are a habit that takes consistency and dedication, and weeks and months of practice. But the work is well worth it! My children are not perfect, far from it, and we still work on manners, even with the older ones, every day. But I have found four different ways to teach and reinforce good manners, and I’m enjoying the fruit of this work now. When we were first starting out, I decided that being reactive about manners was the wrong approach. What I mean about being reactive is responding with a manners reminder after the offense has already occurred. It just doesn’t work. If you want your children to truly internalize good manners, the teaching has to happen first, and then you have to give your child a lot of practice. It’s easiest for the child if you focus on one new habit per week. The obvious place to begin is with “please”. So instead of constantly reminding/nagging your child to say please, start off at the breakfast table with a discussion. Talk about when “please” should be used, how it should be said (with a good attitude! ), what you can expect when you use “please”, what you can expect when you don’t use “please”, etc. If you want your children to truly internalize the manners habits that you are teaching them, you are going to have to practice with them. As I mentioned above, reacting is not practicing. 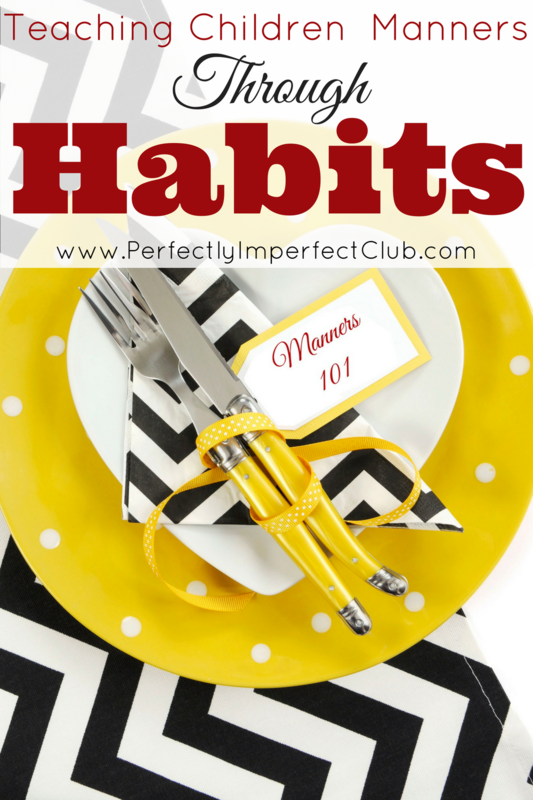 Proactively teaching manners means reminding them of the habit, and then giving them the opportunity to practice. Practicing means setting up daily scenarios. It’s reminding them BEFORE they forget. So, if you are trying to teach your children to say “Please” after you follow step 1, you will say “And now we will practice. Watch how I do this. Johnny, would you PLEASE pass me that napkin?” Johnny passes the napkin, say thank you, and then instruct Johnny to ask his sister for an item nearby and to do it using please. Continue this exercise for a minute or two (it will get old quickly unless you are teaching very young children). Now, go about your day for a bit. But look for another opportunity to be proactive. If you know that it is getting close to snack time, or lunch time, remind the children to say “please” when asking for their food, etc. If your child should ask you for something without saying please, don’t ask them “what do you say?”. Just look at them with eyebrows raised. Older children may catch on quickly and ask again with a “please”. But younger children may need a memory jogger. But you aren’t just going to give it to them, make them think about it. Instead of asking “what do you say?”, instead, say something along the lines of “I seem to remember that we had a discussion this morning about something…….now what was it………” and wait for them to remember. If you are dealing with a very young child, then you will need to be very patient with them, you may have to go ahead and just remind them to say “please”, but when they do it on their own, make sure to give a lot of praise and hugs. Just remember to do your best to bring it up the weekly manners habit throughout the day, get in front of it in situations where you know they will be asking you for something, and play up the praise when you hear it happening naturally. This is a fun way to reinforce the children’s efforts. Give random rewards when you hear a natural “please”, or whatever other manners habit you are working on. Do NOT reward every time you hear it, it must be random or it won’t be nearly as effective. In my home, chocolate chips are currency. Whenever I want to randomly reward behavior (depending on the size of the reward) I will go grab 1-5 chocolate chips from the jar. It’s cheap and delicious, and will motivate your child to keep trying! This last method is only used for bad manners which are offensive to me and other people. If I had a child who struggled with bad language, I would fine him (I’m sure you’ve heard of the swear jar? It’s not a new concept). In my home, my children who are old enough to control it are fined for burping and passing gas in front of others, they are also fined for bathroom humor. The fine is $1 and they have to hand it over when they are paid each week. It works really well. I’ve made around $50 in the last six months, and there has been a considerable drop in these bad habits. My husband says it’s not fair because I feed the children so many beans, fruits, and vegetables. I think he’s just jealous because I don’t share the money with him. Teaching manners is not difficult, you just have to firmly resolve that your children will be more mannerly, and then take action. You cannot expect perfection from them, but you can raise the bar for acceptable behavior. Doors will open for your well-mannered children one day that may have otherwise remained closed if they had not become more courteous. Good manners are becoming so rare that they stand out. Help your children stand out for good reasons! If you’ve read anything about me, you know that I wear makeup just about every day. I’m not talking full beauty queen makeup, but my everyday face generally falls somewhere between the “No Makeup” look and “Casual Date Night” makeup. For several months I stuck to the “No Makeup” makeup look, using just BB Cream, blush, mascara, eyebrow powder, and lip balm. But honestly, this look wasn’t me. While lovely on a lot of women, I feel more like myself with some eyeshadow, eyeliner, a matte foundation and powder (although I do switch to a BB Cream cushion in the summer, it’s too humid to pull off a matte look where I live), and a strong lip. Now, if you don’t already know, I’ve got a lot on my plate! 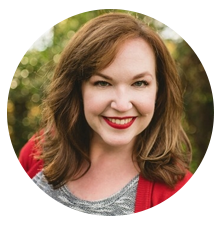 I have nine children, I homeschool, I keep the house reasonably tidy, and I have my own business. So how on earth do I have time for a beauty routine every day? Queue the Ten Minute Beauty Routine! Every woman, no matter what her makeup preferences, really needs a 10 Minute Beauty Routine that becomes a daily habit, no matter where she is going, no matter what she is doing. I’m not just talking about makeup here, I’m talking about skincare too. If you prefer no makeup or minimal makeup, that’s totally fine! But having a daily ritual where you groom yourself is a must. Being intentional about what you include or exclude in your own routine turns a reactionary haphazard effort into a proactive, calming, rejuvenating morning kick-off. The first step you will need to complete before putting together your 10 minute beauty routine is to decide on your signature, everyday look. Pick a look that makes you feel happy and energized when you look in the mirror. As I mentioned earlier, my signature look is matte foundation and powder, blush, the slightest bit of cheek contour, eyebrow powder, eyeshadow, eyeliner, mascara, and a strong lip. Face—My absolute favorite type of face makeup is the powder foundation. It’s the speediest way to an even skin tone. I need to find an inexpensive alternative to the MAC Studio Fix powder foundation that I have used and love. I’ve tried the foundation powder by Maybelline, but the color wasn’t a good match, and the staying power was awful. Another good option for the speediest face is the BB Cream cushions. I’ve only ever tried a Korean brand called IOPE. It’s fantastic, and I can whole-heartedly recommend it. It’s what I use in the summer, and gives a really lovely, dewy look that is perfect for summer humidity. What I currently use is L’Oreal’s matte foundation in the palest shade, applied with a damp beauty blender, paired with Rimmel’s matte powder. It’s a cheap combo that stays nice all day. Think about the look you prefer for your face, and then choose the best product. If you like matte, you’re probably going to do best with a matte foundation and powder. If you like light coverage, try a BB Cream, and know that the BB Cream cushions will give you the quickest application. Cheeks–Blush is a must! Even for the minimalist, use some blush to give yourself a rosy glow. Contour if you like to, but go really light and easy. My contouring takes me less than 15 seconds, and I blend, blend, blend. Eyes–Decide how natural you want to go. If you have long, dark lashes, you may forego mascara, same goes for eyebrows. I use both eyebrow powder and mascara because my hair is lighter. If you want to brighten your eyes, use a simple eyeshadow palette. I use Kat Von D’s plum palette but I only use two colors from it for daily wear. I use a light hand applying, and blend, blend, blend. I finish it off with some eyeliner, make sure you opt for a smudge resistant eyeliner so you don’t end up with raccoon eyes half-way through the day! Lips– Again, you are going to need to decide how natural you want to go. Many, many women opt for lip balm or gloss and look amazing! I go this way too, probably half the time. For everyday lip-color, I really enjoy a long-wear, transfer-resistant liquid lip color. I’ve used Cover Girl Outlast, and the L’Oreal one too. Unfortunately, neither of those brands make a good red that doesn’t end up looking worn. However, both brands have great colors in the lighter and mid-range that wear really well and stay on all day. I’m going to give Mac’s liquid lipstick a try though. I have recently bought Mac’s liquid lipstick in a shade of red, and it is a great formula! The color stays perfect all day long, even through eating and drinking. It does, however, kiss off on my children’s cheeks just a little. Not nearly as badly as regular lipstick, but it is not entirely transfer-proof. I already wear Mac’s Ruby Woo almost exclusively when I leave the house, and I absolutely adore it. But for wearing around the house….my children end up with kissy marks all over their faces. So for me, long-wear, transfer-resistant is important at home. Your everyday look will probably look different from mine, and that’s great! Choose what makes you feel like a million bucks. 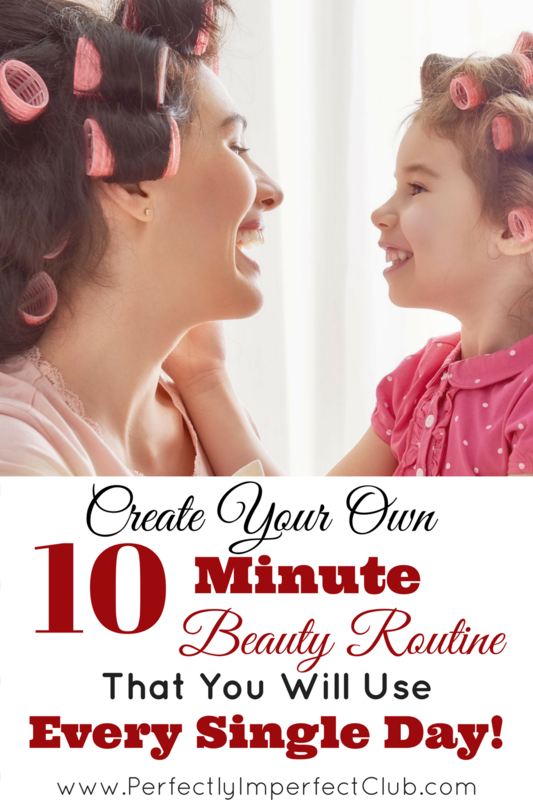 Now that you know what makeup you want to put on, it’s time to create your own 10 minute beauty routine. Your routine needs to begin with your skin care. Cleanse, tone, moisturize, serum, you know the deal. Complete this step as soon as you are out of the shower so that while you are dressing, your moisturizer has time to settle into your skin. Then go right into makeup. For daily makeup, don’t bother with primer, unless you will be going out later in the day for a date, or a meeting. Adding additional products will make everything take longer. I use a long-wear foundation that most likely has some primer in it, and it has excellent staying power. I can powder my nose half way through the day if I feel the need and look fresh as a daisy! Another tip for doing your face quickly, is not to sit down in front of a make-up mirror. Just do it standing, and get it on quickly. I will sit down in front of my mirror once or twice a week to tweeze and take a closer look at my skin, or if I am doing heavier make-up for evening. But for everyday, I prefer to be quick. After everything is in place on your face, move onto your hair. I only wash my hair every third day, so I really don’t have to spend an extraordinary amount of time getting my hair ready. I use a mega-hold hairspray, so I may just need a quick touch-up with the curling iron or straightening iron, and I’m set. Find a way to get your hair styled quickly. The important part is that it makes you feel cute. Whether it’s a tousled bob, sleek ponytail, a quick chignon, or a messy bun, how does it make you feel? If you love it, then it’s perfect! Treat your daily 10 Minute Beauty Routine as a time to get yourself into the right mindset for your day. It’s not just about looking great, it’s about feeling great about yourself, being prepared for whatever the day throws your way, and treating yourself like you matter. Because you do! A few years ago I was reading on the Balancing Beauty and Bedlam blog and I stumbled across an old article about how the author, Jennifer, would cook up a huge quantity of a meal (about three times larger than what they could eat at one setting), and then, she would take the leftovers and divide them in half, and serve them two different ways over the course of the next two days. So she put in the work up front to cook once on day 1, then on days 2 and 3, she spent a little bit of time turning the first meal into something totally different. I’ve always loved this idea because let’s face it…coming up with and cooking a brand new meal for each day is sometimes daunting. And on the busiest of weeks, it becomes considerably more difficult. I started putting Jennifer’s excellent “Cook Once” idea into practice, and I have a few different main staple meals that I do it with. I’d love to share one of those meals with you. I make up an enormous (seriously, it’s HUGE!) pot of chili on day 1. I keep the costs lower by only using two pounds of ground beef, and using six cups of dry beans. I also buy the institutional sized cans of diced tomatoes, crushed tomatoes, and tomato sauce instead of the much smaller cans. I throw it together in the morning, let it simmer all day, make a simple cornbread recipe in the evening, and serve it with sour cream and shredded cheese. It’s always a huge hit, and there is always a ton left over. On Day 2, I will take half of the leftover chili and make it into Chili Mac. First I add at least four cups of water to the chili to thin it out, and I heat it up until it is simmering. I cook the macaroni right in with the chili, so you have to add enough liquid for the pasta to cook well. So I add the right amount of macaroni, which is usually just one box worth for our family, we like to have a higher chili to noodle ratio, but if you don’t have quite as much leftover, or you need to stretch it for a crowd, just add more macaroni and more water. Simmer the chili mac until the noodles are the right consistency (I go just a little longer than the box directions, al dente Chili Mac isn’t that great). I stay close to the stove while the pasta is cooking and stir every few minutes to keep the beans or the pasta from sticking. After the pasta is done, taste and adjust your seasonings. I serve this up with sour cream and shredded cheddar cheese again. On Day 3, I make up a Chili Tater Tot Casserole. The first thing that you need to do is get the tater tots in the oven and get them nice and crispy and golden brown on a baking sheet (usually about 30 minutes in a 400 degree oven). While the tater-tots are cooking, warm up your chili and thin it out some. You don’t want it to be soup consistency, but you do want it to be thinner than chili. The tater tots will absorb some of the liquid, so you don’t want to be left with dry, crusty chili. Once the tater tots are crisp and the chili is hot, spray a casserole dish with non-stick spray, scoop your tots into the dish, and level them out. Then, pour the chili on top, and top it with a layer of shredded cheese. Place your casserole dish back in the 400 degree oven and let it cook for 10-15 minutes. Serve with sour cream. None of these three meals are an exact science, notice I didn’t provide a recipe for any of them. This is because you’ll need to adjust these for your own family’s tastes and preferences. Every family has its own chili recipe, so use yours and get started! Cooking this way is especially helpful during a busy week when you would otherwise be tempted to order take-out or use more expensive convenience food. I always serve each meal with a salad. All of the tomatoes in the chili are fantastic, but I like to add in something fresh too. 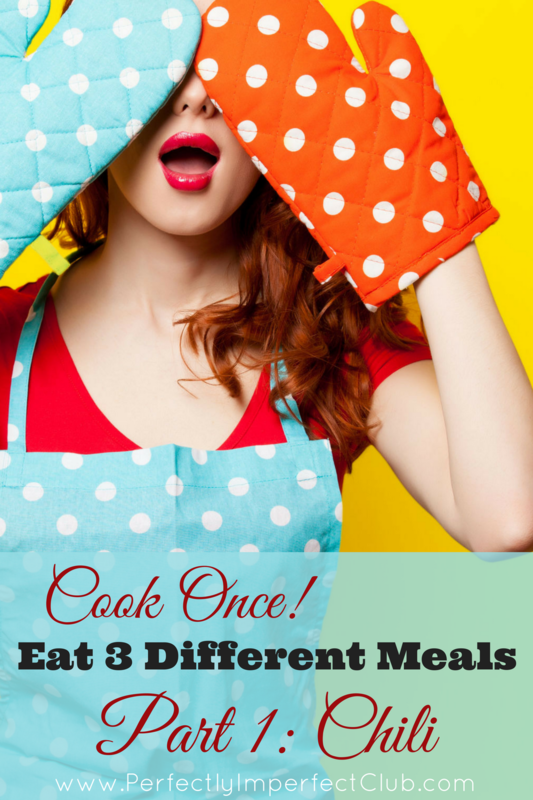 This principle of Cook Once, Eat Three Different Meals is just one more weapon in your arsenal to keep your grocery budget down, and the health of your children up.